My source said it is 1 mile from the centre of Avebury’s monument to the centre of Silbury Hill but when I checked I found it is 1 mile to the far side of Silbury Hill which is no problem because the mile is still featured and the offset works perfectly with other design factors. For example if we project the slope angle from the far side of Silbury Hill over Avebury it increases 3168 Roman feet in elevation above the centre of Avebury’s monument which equals the full design Pyramid’s base perimeter. The four measurements featured below are also featured inside the 1 inch to 1 furlong scale model great circle of the earth above and three of the circles below are also scale model great circles of the earth on the scale of 1 inch to 1 megalithic mile, 1 inch to 1 Roman league and 1 inch to 1 Roman mile. 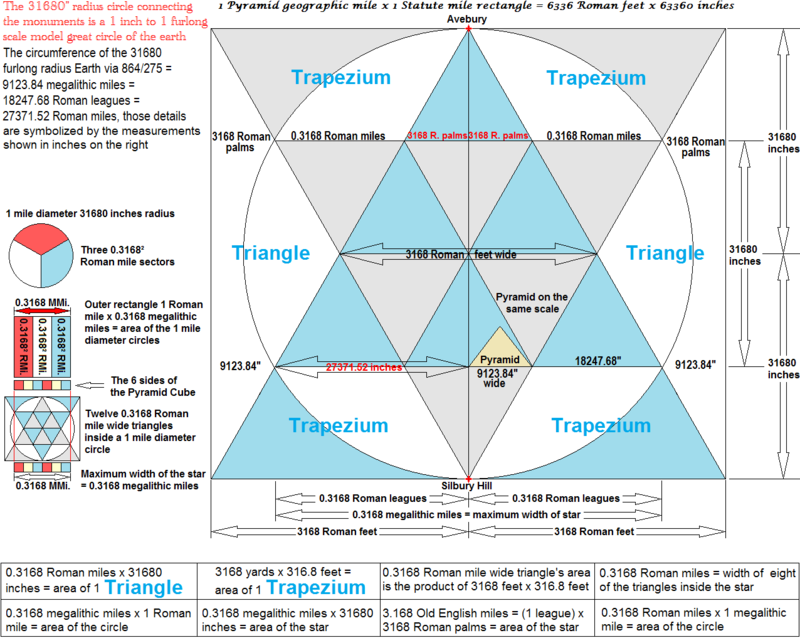 The measurements #1, #2 and #3 refer to the earth’s circumference and #4 is 36495.36 inches or 3168 Roman feet which refers to a 31680 mile perimeter square fitting tangent around the earth’s circumference, also the English monuments have shown that the 36495.36 inch perimeter of the full design Pyramid’s base (square #4) refers to 1° of the earth’s circumference = 36495.36 feet, it is also interesting that 36495.36 miles = 31680 Pyramid geographic miles.